Creativity in machine embroidery and sewing. Two new patterns are out by Amy Butler, she just put the finishing touches on them. I was waiting for this day as I am sew interested in the Field Bag & Tote!!! Big bags are the in thing and this bag is really sharp. This design, depending on which you choose, can have a zippered closure or not. Can use one fabric or make with a coordinating fabric. The bag has lots of pockets inside for organizing your items and can be used for everyday use, crafting, week-end get-away or to the beach. Amy’s other pattern is her Mini-Dress, Tunic and Tops. This pattern comes in both girls and womens sizes. Lots of versatility. And depending on the style you choose, you can have pockets. Go to the link to see the sizes and other information on this pattern that Amy designed. Check out Amy’s “FREE” pattern for her Daisy Chain Strippy Quilt. Go to Amy’s web-site or click here for the free pattern. As I am not a quilter, but from the looks of it, it looks very easy to put it together. 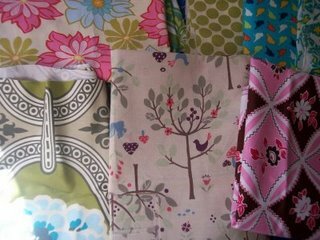 The fabrics used to make this quilt is from Amy’s Daisy Chain Fabric line up. Don’t forget to check out all her other free patterns. While your checking out her fabric line, swing over and see Amy’s new Midwest Modern 2 fabrics that she recently introduced. Some real nice fabrics out there. 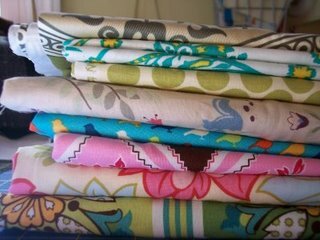 I love the fabrics from her Midwest Modern 2 line. I like the swirls and colors, as shown in her Field Bag and Tote. Katie is celebrating her two year anniversary since she started her blog. She will be filling up a flat rate box with all types of fabric, including some of her favorites, Amy Butler, Sandi Henderson and Erin McMorris. Some of my all time favorites and hopefully yours too. The photos are some of the samples of fabric that she is planning on stuffing in a Flat Rate box, with a possibility of a piece of vintage fabric too. There are several different ways of entering this giveaway, so flash on over to her site and make sure you get your entries in before November 5th because she will be picking the winner on that day. M&J Trim – Purse Accessories and More!! !